Newton Baten Alderman followed his father, James, to Colorado in 1872 when Newton was twenty years old. Newton became a landowner in Douglas County in 1876. He started with 160 acres and by 1904 he had acquired over 600 acres in the very south east corner of the county. The boundaries of his ranch were El Paso and Elbert Counties on the south and east. Newton started a family with wife Ida Stark in 1882. Their children, James G. “Jay”; Minnie (adopted); and Ida. The Stark family was another that came to the area and also homesteaded. Newton’s wife, Ida, died in 1887 and two years later Newton married Georgia Sutphin, who was born in New Jersey in 1858. 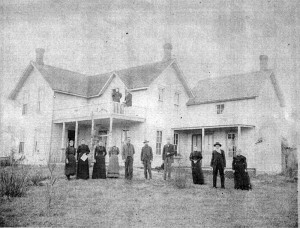 Newton built his house in 1879; he brought his new bride, Ida, to a well established ranch. It was in 1893 that a large barn was built, but it had to be replaced in 1919 as this building, which was renowned for its size, was burned to the ground by a lightening strike. In an 1894 Castle Rock Journal newspaper article the paper referred to Newt’s place as the Silver State Farm, but family information refers to the place as the Cherry Creek Ranch and says that Newton Alderman formed the Cherry Creek Stock Farm Company where he bred horses and cattle for meat and dairying. A silo had been built in approximately 1910 which was 16’ high and 30’ in diameter, which was called a “modern” silo and “one of the best investments a dairyman can make”, according to the Record Journal newspaper. This ranch, also, was known, agriculturally for its; beets, corn, potatoes and various grains. Angus and Jersey bulls were raised along with horses and pigs. Cows were kept for their milk which was taken to the Spring Valley Creamery which Newton co-owned. At one point he brought 400 lbs of milk to the creamery along with cream that he produced on the ranch. Veal, also called baby beef, was shipped to Denver along with many high quality steers and pigs. Grains and other produce were often taken by wagon to nearby Elbert County. Newton’s son, James Grant, known as Jay, served in WWI in France. Newton received a letter from Jay in July of 1918, the Record Journal reported that “Jay was well and happy (and wanted friends to write) often as he wasn’t very well acquainted in France.” Jay came home soon after that letter and married Arla Halley, from South Bend, Indiana, in 1921. Jay kept up the tradition of ranching in Douglas County, living in Spring Valley, sending his milk to the creamery and having his oats ground locally. Thanks to the Colorado Historic Newspaper Collection.